After the world’s finest California table grapes are carefully hand-picked for color and rigorously tested for just the right sugar content, one of their worst enemies all comes down to one critical detail: unwanted moisture. If unwanted moisture occurs prior to or during the grape packing process, or even during shipment, that can lead to mold growth well before the perishable product arrives at its destination. And that then leads to very unhappy customers on the receiving end. That’s why grape grower, packer and shipper Jakov P. Dulcich & Sons has invested in four Entrematic I-Class™ industrial HVLS (high volume low speed) fans as integral components of its relatively new 16,000-square foot California table grape packing facility in Delano, Calif. 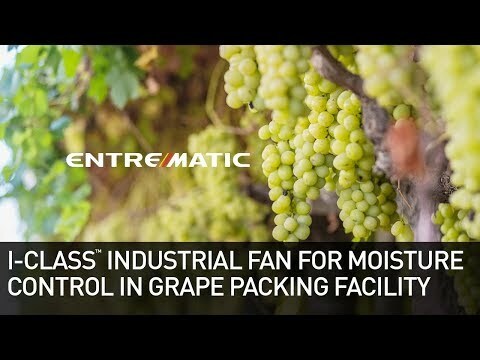 Among several benefits, the fans work hard to ensure that the company’s grapes remain free of unwanted moisture, especially during the critical packing process prior to shipment. Maintain optimal air temperature and airflow, protect perishable products from unwanted moisture and keep employees comfortable during harvest season throughout a 16,000-square foot table grape packing operation that ships 60,000 boxes daily worldwide. Two 24-foot and two 12-foot diameter Entrematic I-Class™ industrial HVLS (high volume low speed) fans operated via the fan network’s iFAN® control system. A stable and consistent 52-degree table grape packing line that ensures high product quality, anticipated lower energy costs for air conditioning, as well as much more comfortable employee working conditions. In 1959, Jakov Dulcich and his wife emigrated from Croatia to Chile. Only a year later, they settled in Delano, Calif., one of the best grape growing regions in the world. They then worked in vineyards owned by Jakov’s uncle, saving enough money to invest in their own small piece of farmland in 1975. Today, the Dulcich’s sons, Nick and Peter, continue to expand the farm their parents founded. It now includes 6,000 acres of vineyards and a multimillion-dollar, state-of-the-art storage and distribution center. The facility includes a packing line operation, receiving area as well as 60,000-square feet of cold storage. Jakov P. Dulcich & Sons, as a grower, packer, shipper, markets 15 different varieties of red, green and black seedless table grapes. Harvesting normally occurs between July and mid-November when the operation employs anywhere from 200 to 500 workers and ships approximately 60,000 boxes worldwide each day. McCaa further explained that the inside packing area also helps to ensure that company’s table grapes are consistently packed at the correct weights so customers receive what they are expecting to receive. Packing the grapes inside also protects the product from the rain. Jakov P. Dulcich & Sons keeps its packing room at an even 52 degrees F so that when harvested table grapes are removed from cold storage, they won’t begin to sweat. That could then cause unwanted moisture issues in the product’s packing. Vital to Jakov P. Dulcich & Sons’ quality, moisture and temperature control efforts are two 24-foot I-Class HVLS fans located above the 16,000-square foot packing line area and two 12-foot I-Class HVLS fans in the operation’s receiving area. McCaa also emphasized that employee comfort in the packing room is an important concern. In addition, Jakov P. Dulcich & Sons was focused on reducing the amount of expensive energy consumption that is required to the keep the packing line at just the right temperature. Jakov P. Dulcich & Sons’ forklift drivers are benefitting from the two 12-foot diameter I-Class HVLS fans as well. The fans keep the drivers more comfortable while waiting for the table grapes to arrive in totes on pallets from the field. Once the grapes arrive at the receiving area, the drivers unload the palletized grapes onto a conveyor belt. From there, the palletized grapes are wrapped with plastic film to await transport to cold storage for chilling. The receiving area’s fans not only help to provide air movement to keep drivers comfortable, they also provide needed airflow for the pallets of grapes that are stored short-term in the receiving area prior to chilling. All four I-Fans at Jakov P. Dulcich & Sons feature black blades with silver hubs, struts and motor cover. McCaa said he began his fan search online and really liked what he saw on the Entrematic Fans website. “Compared to other fan companies that we researched, what stood out most for us with Entrematic Fans are product quality, the fan blade configurations, overall design features and silent operation. We also found the Entrematic Fans airflow videos very educational and informative,” he added. McCaa explained that he simply sent Linder photos so that Entrematic Fans could then spec the proper size and locations for the I-Class fans. Extra required parts, which included pole extensions, were also shipped and delivered in a timely manner so that Jakov P. Dulcich & Sons’ electrician could move ahead with the fan installations. NEED ONE MORE SUB HEADLINE.